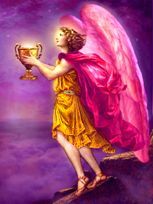 You can call on Archangel Chamuel for all matters of the heart, both big and small. Imagine yourself bathed in a bright pink light. Open your heart and allow him to guide your thoughts and feelings. Write your hopes, dreams, and desires on pieces of paper, light a pink candle and burn them. Watch the smoke rise, knowing your requests will be willingly granted by Chamuel. Chamuel's name means, 'He who seeks God.' He is often described as "pure love in a winged form". He encourages open-mindedness and reminds us that we must love ourselves first if we have any hope of being able to love others. Chamuel will help you relase judgemental attitudes, even if you are unaware of the. He will help you use your shortcomings as an opportunity to connect with your spirit, rather than carry them as a buden. He is said to be of the two angels who comforted Jesus in the Garden of Gethsemane. When you call upon him, you may see a ray of pink light. Chamue will help you develop compassion, improve your ability to communicate, balance your life, and understand the value of helping others. When you feel lost or overwhelmed you should call on him. Chamuel will also help you heal family dysfunctions and overcome grief. As someone who is new to learning about the angels, I really appreciate that you are including descriptions about the lesser known ones. I had never heard of Chamuel before. It feels as though calling upon Chamuel is exactly what I need right now. Please continue with this series. I appreciate coming to your blog and learning something new each time I am here.